Are you seeing Orange Screen of Death Windows 10 issues with an error message then it means your PC have a big problem and need to restart? This Windows error is not as famous as Blue Screen of Death, Black Screen of Death, and the new Green Screen of Death. But it occurs when your system effected by a main hardware failure with the display or GPU. But this issue might be caused by some other device or driver. Do you know How To Fix Orange Screen of Death Windows 10 issue don’t worry this guide help you to resolve this problem. Win 10 Orange Screen of Death issue might be possible that the graphic driver is either corrupt or the latest version is not support Windows 10 System. So you need to either update the Graphic driver to the latest version or install new version. Go to Start > type Device Manager > expand the Display adapters category. Right click your graphics card > select Update Driver. Select “Search automatically for updated driver software”. If you get Orange Screen of Death Windows 10 issues, it’s because of incorrect address allocated to the driver. It can also indicate that a kernel-mode driver attempted to access page able memory at a process IRQL that was too high. Did you install software and then faced Win 10 Orange screen of Death problem? I have heard reports of much software which had caused this issue. I would suggest you check the recently introduced software list, and figure out if you had installed anything. If yes, uninstall and check if you still have the issue. 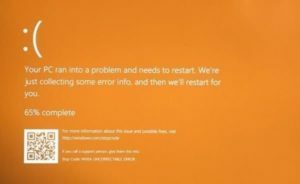 Orange Screen of Death Windows 10 issue might be happened due to installation of unnecessary external hardware such as printers, webcams, additional monitors, mice, head phones, and other external devices. So you are highly need to unplug all attach unnecessary external hardware to fixes the problem. Go to Start button > Settings > System. In the left pane, choose Apps & features. Find softOSD on the list, select it and then click the Uninstall button. If you’re prompted to remove sds64a.sys, skip that step. Whenever Win 10 Orange screen of Death on boot up and you’ve encrypted your OS using Bitlocker or other encryption tool, type your Bitlocker password, and hit Enter. If Duet Display is installed on your computer, simply uninstall it. Ddkmd.sys, a component of Duet Display, is known to cause system crashes on Windows. Game Configuration Files Settings To Default. If you’ve encountered the Orange Screen of Death Windows 10 issues while playing your favourite games, set your game configuration file settings to default. Gamers confirmed that some graphics tweaks occasionally cause OSoD issues. I hope all the above mentioned instruction will help to prevent or fix Orange Screen of Death Windows 10 issue. If you have other troubleshoots methods or steps please share with me in the comment section box.